Hanayashiki (浅草花やしき) in Asakusa, Tokyo, opened as a flower park in 1853 (Kaei 6). 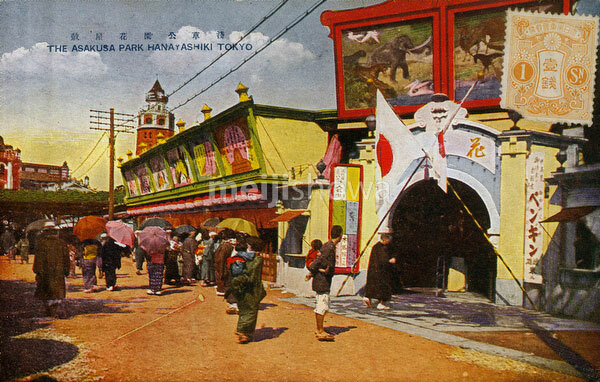 As a popular amusement center it included tea shops, entertainment and animal exhibits. In 1949 (Showa 24) it became an amusement park operated by the Togo Company. In January 2004 (Heisei 16) Togo declared bankruptcy and sold Hanayashiki to Bandai, a Japanese toy company. The tower in the background is Ryounkaku, Japan’s very first skyscraper. It was popularly known as Junikai, or Twelve Stories. See blog entry”.